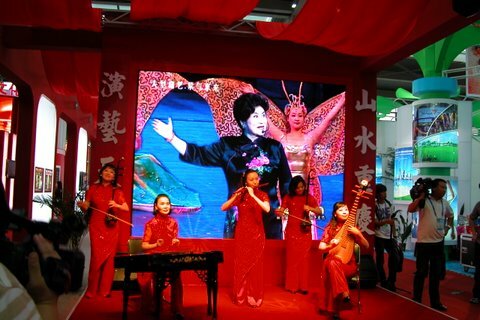 Attendance at a Chinese performing arts trade fair-seminar hybrid is always a surreal affair, equal parts exhilaration, exasperation, unintentional hilarity and unexpected vignettes of our shared humanity. 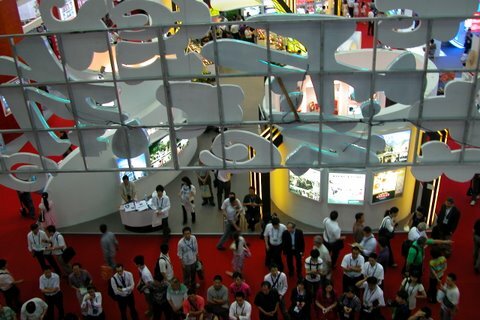 Further to my last post, here are highlights of my recent visit to the 7th International Conference for the Promotion of Chinese Cultural Products in Shenzhen. 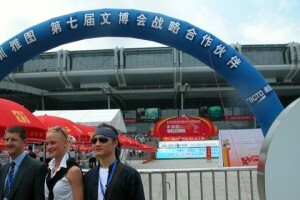 International delegations pose in front of the gargantuan Shenzhen exhibition center. Inflatable arches and huge tethered hot-air balloons inscribed with exhortatory messages are all the rage. The fair covered cultural products in the broadest sense. The more generic provincial exhibits, the furniture, jewelry, crafts and video/new media were housed in this building: the performing arts were exiled to the lobby of the Shenzhen Poly Theatre and an adjacent building. 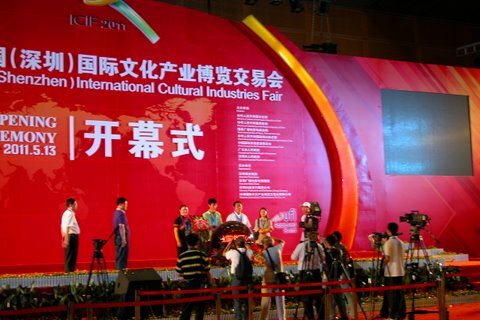 After the official opening, the inevitable TV commentators discuss the importance of the fair. Though a few foreign officials from Guangzhou consular offices attended, I did not see any foreign press. Window dressing, surplus labor: seen everywhere at meetings, restaurants, etc. The young Chinese have labeled them “vases”: i.e. they look pretty but don’t do anything. 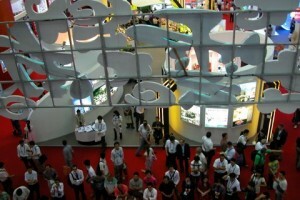 Looking down onto the exhibition hall floor. 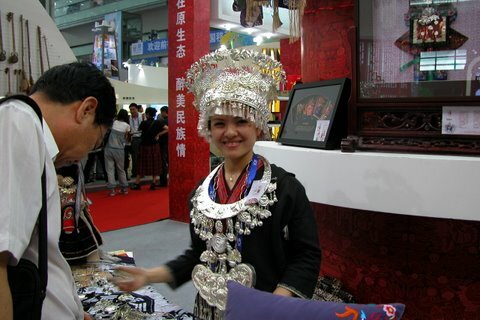 A woman of the Miao minority. China’s minority cultural products were widely showcased. 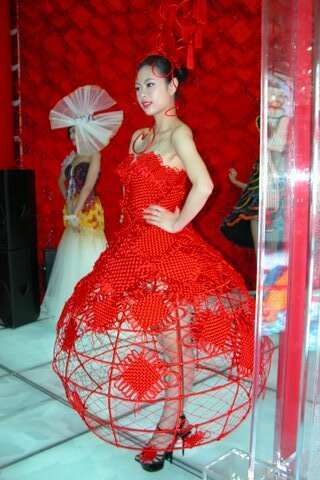 Some displays were tasteful, others felt much more fetishized. Dance and music showcases sprouted on pocket-sized stages throughout the exhibit hall, often in front of video backdrops of relevant provincial scenery or yet other performances. 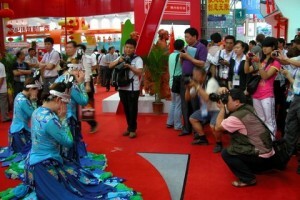 Domestic media swarmed the most colorful and emotive performances, as well as the important officials as they inspected the exhibits. 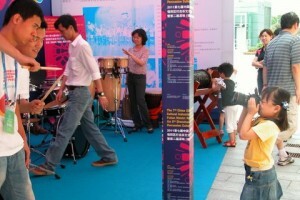 An ear-splitting cacophony. Unfortunately no separate showcases. 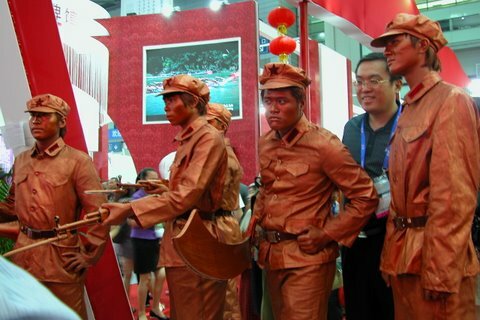 Actors “bronzed” for a revolutionary tableau-vivant. No irony here. Making the old new. Chinese designers have excelled at adapting the traditional into the arresting modern. Though we rarely see the best of this onstage, occasionally a gifted designer such as Tim Yip will take a break from the movies for a stage production. Old plus new: The Chinese long ago embraced Western pop and rock. Note the background wallpaper of traditional Chinese drums, and the Thomas the Tank Engine T-shirt on the toddler. 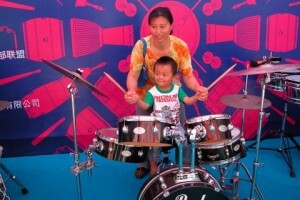 Next generation photo-journalist captures aspiring Chinese hipsters. This could be happening in Brooklyn….. 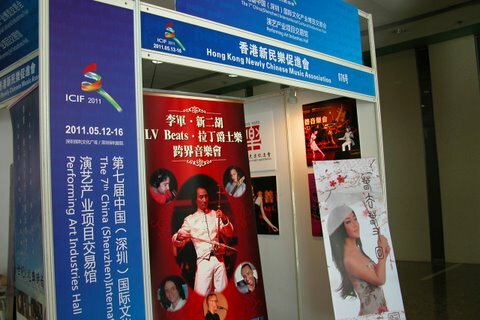 The mission of the “Hong Kong Newly Chinese Music Association” was not clear, and alas, like many of the booths, this one was unattended, with no English-language materials. 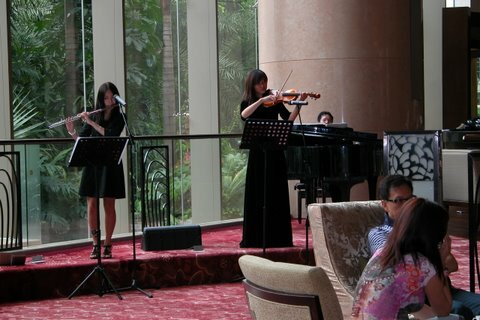 Back at the hotel, recent conservatory graduates provide an afternoon serenade. Such live music is common at the best Chinese hotels. 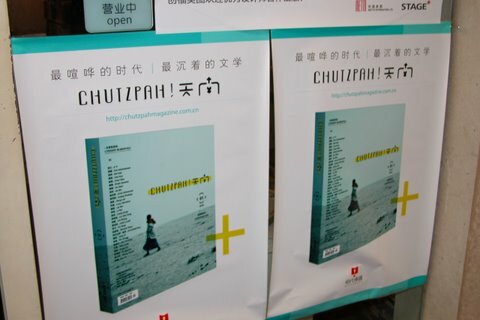 I’d love to see more that in the U.S.
As seen in a bookstore window in a Soho-like Shenzhen neighborhood, “Chutzpah!” is a bilingual cultural journal. 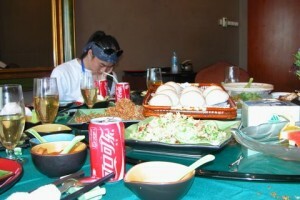 This entry was posted on Wednesday, June 22nd, 2011 at 1:31 pm	and is filed under Uncategorized. You can follow any responses to this entry through the RSS 2.0 feed. Both comments and pings are currently closed.